On Tuesday July 12th the wonderful folks at Jaxx were kind enough to host a Media Dinner for the North Texas Press Club. 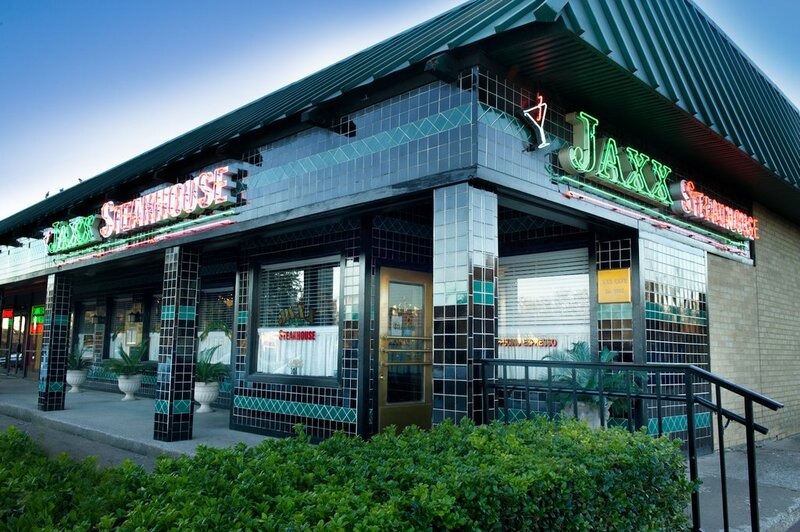 Jaxx has been a staple of fine dining in Addison since 1992, serving up quality steaks, seafood, pasta, and fine wine. The place has a sort of “Rat Pack-ish” feel to it, with a dark wood, brass, and leather decor. Jaxx has seen its share of celebrities come through, in fact, this used to be one of Mickey Mantle’s hangouts. 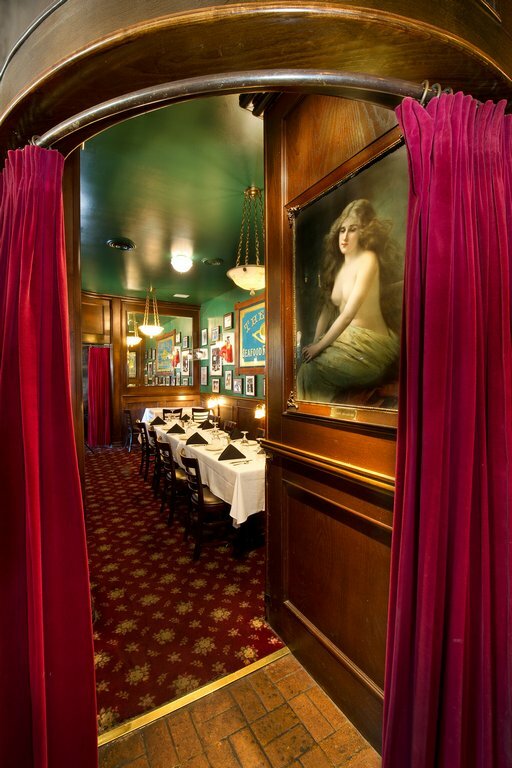 The walls are adorned with a considerable number of celeb-signed photos and memorabilia. For some reason, this makes me want to sip on a big martini up at the bar. While ownership has recently changed hands to Mr. John Kim, Chef Marcelino has been at the helm of the kitchen since the restaurants inception, which accounts for the consistent quality of the food that they produce. On our visit, Chef Marcelino presented us with a wide sampling of menu items; for starters we were served a plate with sashimi-style, sesame seed-coated Ahi Tuna, pan-seared with a Teriyaki-Wasabi-Ginger sauce, a mini crab cake, shrimp cocktail, and crispy calamari. The shrimp were large and fresh and the cocktail sauce had enough horseradish for me (I like to feel the burn and find most cocktail sauces to be on the wimpy side, the Jaxx sauce was not).The calamari was crispy and, dressed in a little lemon juice, it was light and tasty. The soup and salad course consisted of a cup of Jaxx renowned Boston clam chowder, which has been touted as the best in the Metroplex, and a Greek salad with rosemary vinaigrette. The chowder was outstanding and certainly ranks up there with the best that I’ve had in the DFW area. The salad had nice big chunks of feta cheese and kalamata olives, with a tasty dressing that didn’t overpower the other flavors. For our main course sampling, Chef Marcelino chose the signature pepper-crusted filet mignon with cognac demi-glace peppercorn sauce and sea bass with a lobster chardonnay drizzle. These were served with a nice steamed vegetable medley and Jaxx famous twice-baked potato. I’m a huge black pepper fan, so the filet was a treat for me. It was fork tender and perfectly cooked. The sea bass had a great, almost steak-like texture and a wonderful flavor, without any fishy taste (which I encounter far too often with seafood in Dallas). I loved the presentation of the twice-baked potato; a nice center-cut slab of baked potato with the seasoned, twice-baked beautifully piped on top and garnished. Dessert offerings were white chocolate bread pudding in bourbon sauce, topped with vanilla bean ice cream, or house-made classic cheesecake with strawberry and mango purees. I had the bread pudding and my wife Lisa had the cheesecake. They were both wonderful and the bread pudding is some of the best that I’ve tasted. The staff was very friendly, attentive, and accommodating. Our head waiter and long-time Jaxx staple, Darryl, was funny, charming, and very informative. Jaxx has a private meeting room that can handle events such as business meetings, private parties, rehearsal dinners, and wedding receptions. The next time you’re in the Addison area and are looking for an upscale (but not stuffy) meeting place, a strong cocktail, or a nice steak and a bottle of wine, drop into Jaxx and rub shoulders with professionals, celebrities, and regular folks who are all enjoying a generous drink and a great meal.